In the early hours of March 23, the first prime minister of Singapore, Lee Kuan Yew, passed away. Until his dying day, the mastermind of the “Singapore economic miracle” commanded great respect and love among the citizens of Singapore. His experience remained relevant for world leaders and economic figures from many developing countries, including Russia. RBTH rounds up the early Russian reaction to the news of Lee Kuan Yew’s death. Putin expressed his condolences to President of Singapore Tony Tan Keng Yam following the death of Singapore’s longstanding former prime minister and one of the “patriarchs” of international politics, says a statement posted on the Russian president’s official website. “Over his decades of work as prime minister and in other high government posts, he earned his compatriots’ sincere love and respect and won the highest international influence,” said Vladimir Putin. The Russian president also stressed that Russia will remember Lee Kuan Yew as a consistent supporter of developing friendly relations between the two countries, who made a great personal contribution to strengthening mutually beneficial bilateral cooperation. 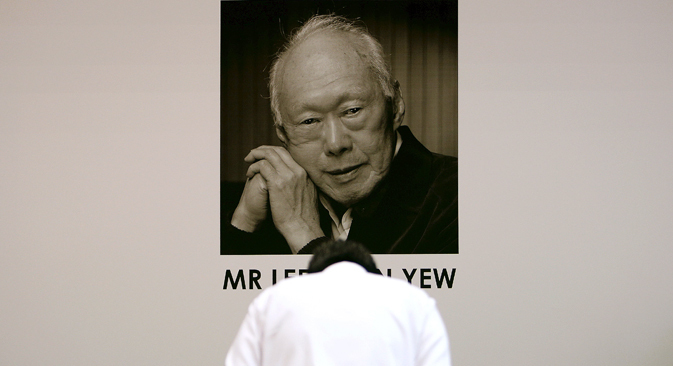 Lee Kuan Yew, who created modern Singapore, has died. He had faith in Russia. I was fortunate to have met that wonderful man on more than one occasion. The best memory that Lee Kuan Yew has left us with is the Singapore miracle, a prosperous and educated country with low corruption that was built out of nothing. Lee Kuan Yew did not consider himself a genius. In his book From Third World to First: The Singapore Story, he said that all the decisions he had taken were to a certain extent obvious: For Singapore to survive, it was necessary to create a competitive economy. To that end, it was necessary to attract foreign investors and to improve the quality of education of the local workforce, to eradicate corruption and create the world’s best conditions for business. The value of that book is not so much in that it describes what needs to be done for economic development but that it proves that everyday work in the right direction brings fantastic results in just a couple of decades. In his later years, he often visited Russia and he was always asked: “What is to be done?” In 2009, six months after the events in Georgia [the Russo-Georgian war of 2008 – RBTH], while addressing a Russian audience, Lee Kuan Yew said politely but firmly: “It is of course for you to decide but if you need investment and economic growth, it is better to trade with one’s neighbors rather than fight with them.” I think this advice remains relevant still. Lee Kuan Yew has died. I had the pleasure of meeting him in 2010. He was a major leader and a wise man, unlike many modern Western politicians. Each country follows its own path of development. Its success, as the example of Singapore clearly shows, depends not so much on the price of oil or natural competitive advantages but on the talent and honesty of its leaders. This is perhaps what should be the biggest “Singaporean lesson” for Russia.